Ok, I went a little over the top on this one. I can admit it. I just really liked these stickers from Michael’s and I wanted to find a good use for the numbers! 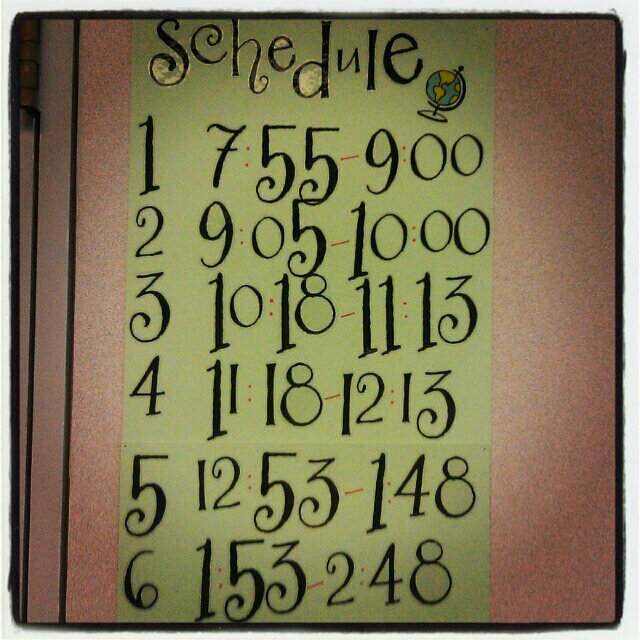 I put the bell schedule in the back of my room this year because, really, I’m the only one who needs to see it! Even if students can’t remember to write their own names on their papers, they sure know exactly when the bell is supposed to ring, so a schedule for them is rather pointless. Actually, though, I have been very impressed by my all of my classes this year when it comes to dismissal. I have always wanted to throw out a, “The bell doesn’t dismiss you; I dismiss you!” but I haven’t ever needed it! I do tend to try and squeeze too much into the last minute and a half of class, but whenever the bell rings, the students brace themselves against their desks and wait for my approval before launching themselves out into the hallway. They’re so obedient!